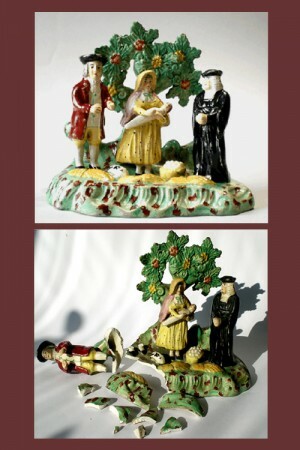 Early 19th century Staffordshire Tythe group needing reconstruction. “My work is restoring and conserving ceramic objects made in porcelain, bone china, stoneware or earthenware. I work in most styles, genres and periods of ceramics – contemporary ceramics, studio pottery, china tableware and china ornaments, small sculptures and figurines, country and artisan ceramic ware. ” Johanna Okon-Watkins, member of the Institute of Conservation (ICON). A good understanding of the history, construction, function, use and value of an object – culturally, financially and personally is vital to the success of the ceramic restoration. To work one week on a Meissen tea pot, the next on a modern sculpture is a delight that keeps Johanna’s interest in ceramics alive. Each ceramic restoration requires thoughtful preparation and planned execution to give the best results. The studio at Pithouse Farm is kept in the style of a surgery, clinically clean and bright. Good light being essential for colour matching and modelling (of missing parts), cleanliness to prevent any contamination of the ceramic artefacts. If you would like a ceramic object restored or conserved Johanna is happy to advise on suitable options. Ideally, she prefers to examine the object closely or to have a group of good digital images showing the ceramic piece from all angles. Johanna is experienced in estimating the cost of a repair and can supply a quotation for insurance purposes. If you would like to know more about the process please refer to the information pages on the website.